The constituency of Titiwangsa is named after Malaysia's "backbone", the mountain range that runs from the north on the Thai border down to the southeast of the country. The district itself is known for the Taman Tasik Titiwangsa, a 46-hectare recreational park that has one of the territory's largest man-made lakes, which used to be a tin mine, and allows aqua biking and canoeing. The park also offers horse rides and horse-drawn carriage rides. 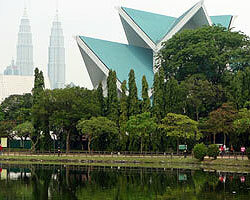 Malaysia's national theatre, the Istana Budaya, or Palace of Culture, is located here.